Let the moon tell you the temperature on the Whitehall Moon Thermometer. This attractive instrument features a smiling moon motif on a backdrop of the constellations, encircled by the months of the year. 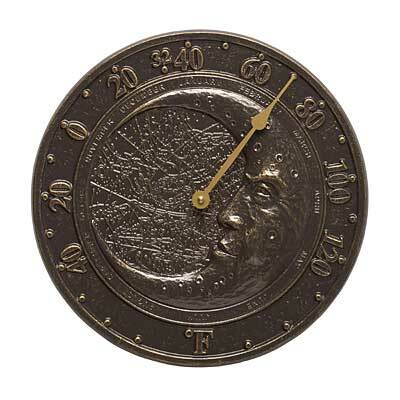 Incredible detail characterizes the moon and writing within the map adds interest to this handcrafted piece. A bright golden hand indicates the temperature across the large numbers that make reading the thermometer an easy task, even from a distance. The temperature gradient spans from -70° to 150° Fahrenheit. The recycled aluminum casting and a weather resistant finish combine to keep the Whitehall Moon Thermometer a beautiful conversation piece, year after year. This thermometer may be hung. Made in the USA.